Thermoplastic single ply roof systems are the number one choice for building owners needing to balance energy efficiency, environmental concern, performance and budget. 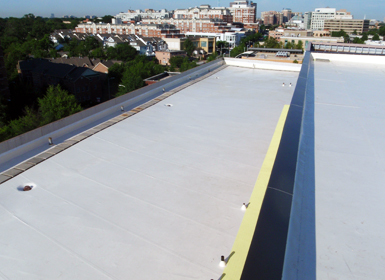 Pioneer has an extensive 30-year track record installing high-performance thermoplastic single ply membrane systems. Pioneer offers only the best available materials, the finest possible workmanship and is committed to staying at the forefront of modern roofing technology. Our Single Source warranties cover both workmanship and materials and are among the strongest in the industry. Our clients can be assured their roof is being installed to the manufacturer's specification. Pioneer is certified by the manufacturer to install every roof system we offer. Pioneer offers manufacturers warranties of varying lengths and can make repairs on behalf of the manufacturer. Pioneer installs other traditional roofing systems as well such as EPDM, Modified Bitumen, and hot rubber. Installing an Energy Star certified single ply system saves energy dollars and protects the environment by reducing the heat island effect in dense urban areas.